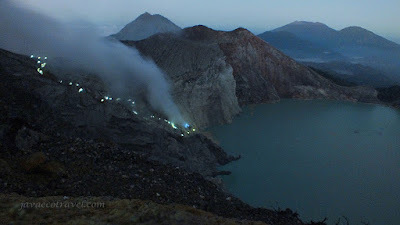 Kawah Ijen is one of the most visited volcano in the world. It is an active volcano which produces tons of sulfur everyday. The landscape of this volcano is very beautiful. Natural phenomena such green turquoise colored lake, and the blue fire that comes out from the fumarol are attracting many people to witness them directly with bare eyes. Kawah Ijen is also well-known as the largest acid lake in the world. Therefore, visiting this volcano for many world travelers are one of most important thing to do. Javaecotravel has some tour programs which combine Bromo and Kawah Ijen. The tour may start from Jogjakarta, Bali, or Surabaya. The length of the tour can be customized depending on your request. For those who like photography, Javaecotravel will make a special photography tour so the clients are able to make many good photos. Please contact us to make a special tour program for Kawah Ijen.